I sent an email to Steve Supple asking if he was sufficiently recovered from a recent cold to join me on another fishing expedition to the Arkansas River. He replied on Thursday morning that he was taking antibiotics and felt good enough to make the trip on Friday. Judging from the fishing reports on the Royal Gorge Angler web site, I felt there was a slight chance of hitting the caddis emergence, but expected to at least have some decent action on BWO’s and caddis pupa with movement. The weather forecast called for high temperatures reaching 70 degrees with a period of cloudiness between 11 and 2 with a 30% chance of showers. We got off to a nice early start and arrived at the Salt Lick Access area just above Five Points by 9:30AM, and we were ready to fish shortly thereafter. We noticed quite a few more fishermen in the pullouts than seen on our last trip in early April. I began my day of fishing in the nice run directly across from the steps down from the parking lot and rigged with a strike indicator, split shot, beadhead hares ear nymph and beadhead bright green caddis pupa. This combination didn’t produce any action in the long run so I crossed at the top and quickly prospected the small north braid and then moved opposite Steve in the long deep pool. This area also did not reward me for my casting, and meanwhile, Steve was landing several fish on his caddis larva imitation. Hearing of Steve’s success with the caddis larva, I swapped the green caddis pupa for a go2 caddis as it showcases a shiny bright green body. At the top of the long deep pool another small channel enters from the north side of the river and features a deep hole at the bend just before joining the main river. The hole is 50% covered by foam, and on one of my drifts on the edge of the foam, I hooked and landed my first fish of the day, a small brown that fell for the hares ear. Next I moved up along the right, north bank to an area with large pockets between widely spaced exposed boulders, and here I landed a second medium size brown. At slightly before 11AM I approached a nice run of moderate depth around some large rocks and I spotted five or more BWO’s fluttering up from the stream. As forecast by the Weather Channel, some clouds moved in and blocked the sun, and I was pleased to see some rising fish as the BWO hatch intensified. This prompted me to clip off the nymphs and I tied on a CDC BWO and this produced quite well as I landed six browns over the next hour or so from three separate deep smooth pool areas. It was too difficult to see rises in the faster moving water, but the smooth slower moving pools revealed fish actively feeding on the surface. At 11:45 it actually began to sprinkle briefly and I wasn’t seeing any likely pools or rising fish so I reeled up my fly and waded back to the highway side of the river and returned downstream and discovered Steve in the nice long deep pool just upstream from the steps and parking lot. Steve suggested I wade in above him as several fish were rising so I took his advice and waded in a few feet and began making downstream drifts in a nice current seam approximately 15 feet out from my position. Sure enough I saw a quick slurp and set the hook and landed number nine on the morning, a small nine inch rainbow. Steve and I ate our lunches on one set of steps below the parking lot and after lunch I decided to walk down along the shoulder of highway 50 to the observation shelter at Five Points and then work my way back up to the parking lot. Steve on the other hand elected to fish in the nice pool and move upstream from there. As I arrived at Five Points I mentally evaluated my options. The BWO hatch appeared to have ended even though it remained relatively cloudy. We appeared to be too early for the caddis hatch as we saw minimal signs of caddis activity and my attempts to fish pupa with movement yielded nothing. I decided my best option was to prospect the ten feet of water along the bank with a Chernobyl ant as an indicator and a beadhead hares ear as my workhorse dropper. This strategy worked like a charm, and I landed eight additional fish in the two hours after lunch on the Chernobyl ant and hares ear combination. All the fish grabbed the hares ear except for one aggressive brown that slammed the Chernobyl. The last two went for the hares ear as I swung it or lifted to recast so I decided to return to the nymph rig in case the fish were tuning into active caddis pupa. I removed the Chernobyl ant and replaced it with a strike indicator and split shot and then kept the BHHE as the top fly and added a beadhead bright green caddis pupa as the point fly. I fished these two flies with quite a bit of movement and landed three additional browns including one decent 12 inch fish. Just after I landed number twenty Steve appeared on the bank above me and asked how I was doing and whether I wanted to stay or move on. I asked if I could fish the remaining twenty yards before I reached the parking area, and he agreed. I failed to land any additional fish in two attractive areas, and then just before approaching the beach by the stairs, I snagged the flies on a large submerged rock and broke them both off. This made my decision to quit easy. Steve and I kept our waders on as we decided to check out some water downstream in Canon City for fish feeding on caddis on the surface; however, when we parked in a parking lot east of Canon City and checked the water, it appeared to be dead. We decided to remove our gear and begin our return trip at around 3:45. It was a decent day but we never encountered any significant caddis activity and the fish were smaller on average than normal. Steve and I agreed that the best action was the BWO hatch that occurred from 11AM to 12PM. 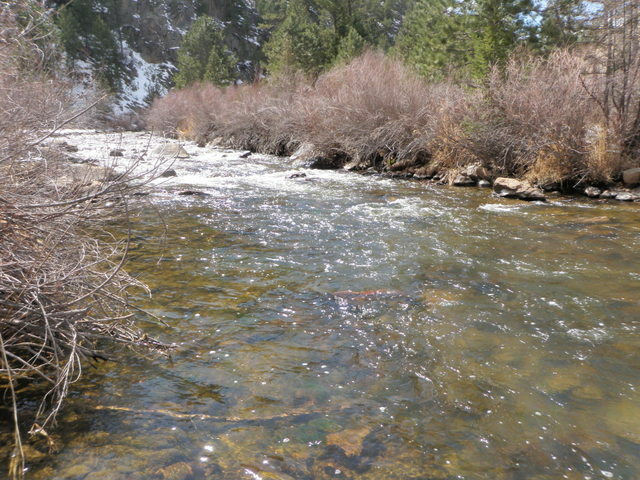 We even shook the willows at the area east of Canon City and saw no caddis flitting up from the branches. The quest for Arkansas River caddis continues. 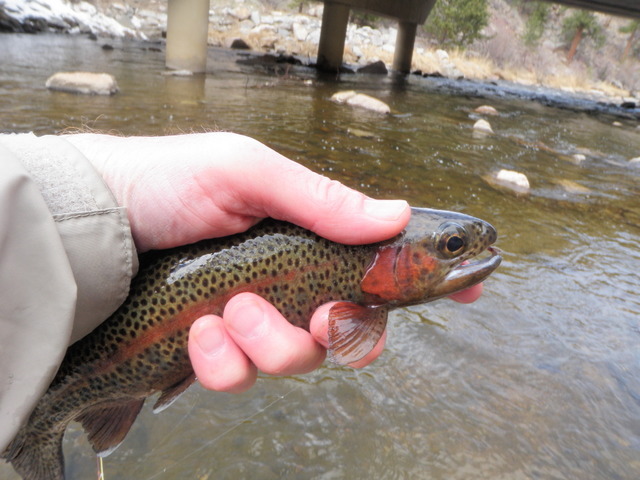 After another April cold snap and snowstorm I was anxious to get out on Colorado streams. 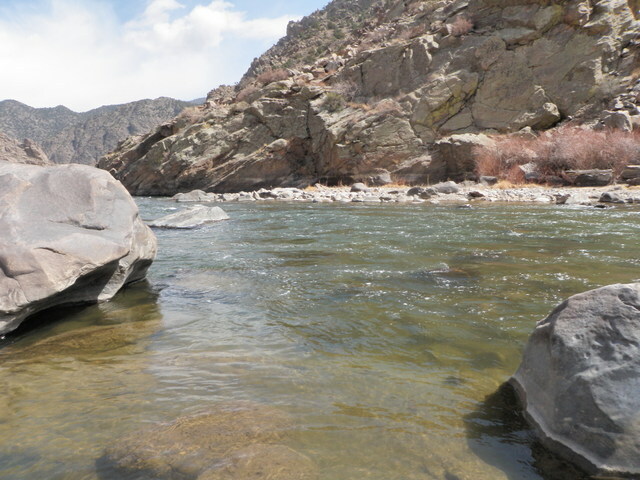 I checked both flows and weather before settling on the Big Thompson River below Lake Estes. The DWR web site indicated flows of 40 cfs, but because this area is higher in elevation than the Arkansas and South Platte drainages, I was concerned about how cold it would be. The high in Denver was forecast to be low 60’s so that translated to low 50’s near Estes Park. I decided to give it a shot, but planned to depart at around 9:30PM and expected to be on the water by 11AM. This allowed time for air temperatures to rise to reasonable levels. This plan worked pretty well and it was 49 degrees when I arrived at the first bridge downstream from Noel’s Draw and quickly prepared to fish. I wore my Under Armour long sleeve shirt along with my fishing shirt, fleece, and raincoat as a wind breaker and I was comfortable for most of the time I fished. 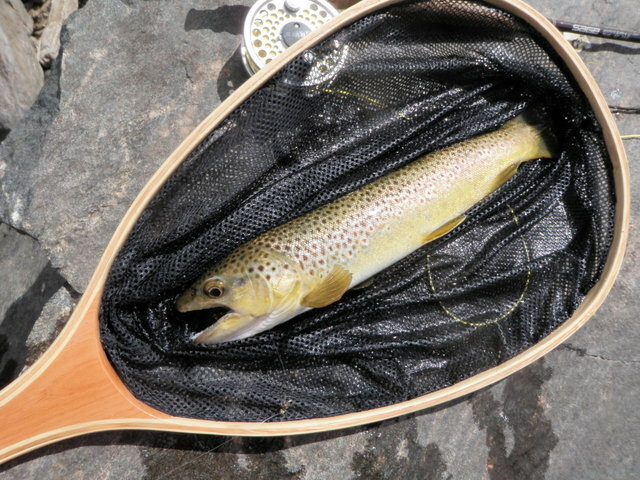 I elected to test my Orvis four weight rod for the first time in 2013 since the Big Thompson is a smaller stream and the flows were relatively low. I decided to walk downstream across the bridge and then another 100 yards or so beyond a small bend in the river to a point where the bank was lower and the water spread out a bit. My choice for the initial stretch of fishing was a Chernobyl ant and a salvation nymph and this performed rather well as I landed five trout before I broke for lunch at 12:30PM. The first three fish of the day, two browns and one rainbow, were some of the largest I would land, so that was an auspicious start. I also noticed several splashy refusals presumably to the Chernobyl ant. When I reached a cement structure that funneled runoff from the road to the river, I climbed up the rocky bank and broke for lunch. As usual I munched my lunch along the river even though the air temperature was probably in the low 50’s. I mysteriously broke off the salvation nymph right before lunch so I replaced it with a beadhead hares ear nymph after lunch, and this yielded three small fish, two from a deep hole slightly upstream from the cement culvert where I ended my morning fishing session. When I waded above the bridge I noticed several active fish below the surface as they darted from side to side to intercept some form of drifting food. Unfortunately they were not interested in my Chernobyl ant or beadhead hares ear nymph, so I swapped the BHHE for a salvation nymph and then added a RS2 as a third fly and second dropper. I managed to prick one fish most likely on the tiny RS2, and then I observed a few fish actually break the surface as they sipped a tiny morsel from the film. It didn’t take long before I noticed some small BWO’s drifting slowly up from the surface of the stream, so I removed the three fly combo and replaced them with a single CDC BWO. It didn’t take very long before I landed a deeply colored rainbow on the tiny olive imitation. Between 2 and 3PM I enjoyed some great suface action and landed six rainbows on the CDC BWO as well as experiencing several momentary hookups. Toward the end of this period before I moved upstream I hooked and landed a nice rainbow that was feeding in some relatively shallow smooth water 25 feet across from me. As I played this fish I noticed at least fifteen other fish scatter due to the splashing and commotion created by my hooked fish. I was amazed at the number of fish that were dispersed across this area just upstream of the bridge. After the fish scatter event I decided to move on and skipped the faster water between the Santa Fe and the next bend in the river. I cut down to the river where there is a tiny island and just above the island there is a nice deep run with some small pools on either side. Here I spotted two fish rising on the right side and I began making some long casts and checking them high to create some slack upon landing. It took awhile, and I experienced a momentary hook up with the larger of the two fish, but eventually I duped the smaller rainbow into sipping my fly and landed it. Next I moved to the left side of the deep run and shot a cast to the top of the smooth area along the current seam. I didn’t see any rises or spot any fish, but as the fly drifted four feet, a silvery dart emerged from the bottom and shot a foot to the right and inhaled my imitation. 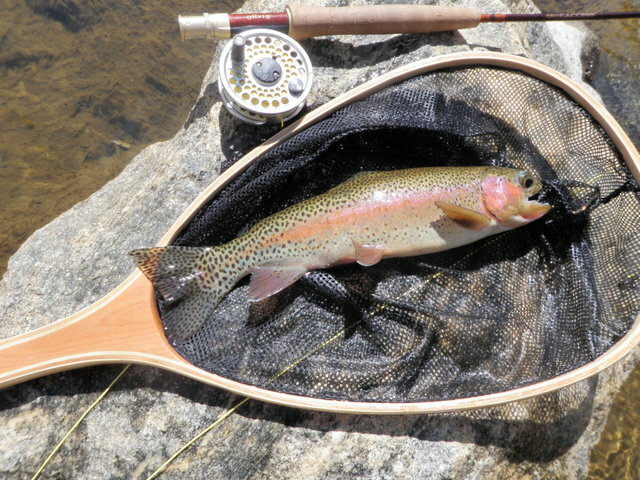 This was the most exciting take of the afternoon, and I landed a fine Big Thompson rainbow. The stretch of water above the pool was not as conducive to prospecting with the tiny CDC BWO and the hatch had pretty much subsided, so I decided to switch to an olive brown size 14 deer hair caddis. I’d spotted a few caddis flitting about so felt this might attract a few aggressive fish still looking toward the surface for a meal. This move proved to be reasonably correct and I landed three more smaller fish, one rainbow and two browns, on the caddis before quitting at 4PM. All in all it was an enjoyable day particularly the BWO surface action between 2 and 3PM. I’d fished the area above the bridge many times before but never experienced much success, but the emergence of the tiny mayflies apparently made these fish more susceptible to my offerings. Two weeks of winter weather in April certainly helped the snowpack and created some nice late season skiing conditions, but it did little to quench my growing desire to feel the throb of a nice fish on my fly rod. By April 21, 2012 I’d already been fishing nine times and landed 138 trout. I certainly don’t wish for another 2012 in terms of drought conditions, but I am anxious to try my new flies and experience some decent pre-snowmelt fishing. 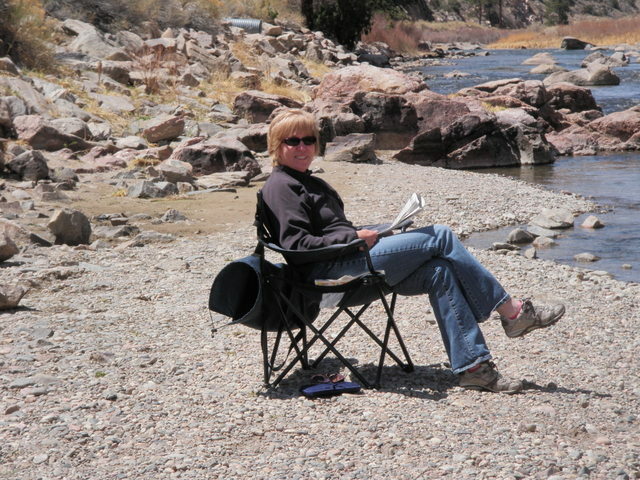 Another spring snowstorm was in the forecast for April 22-23, so Jane agreed to join me on a Sunday excursion south to Canon City and the Arkansas River to enjoy the small window of nice spring weather. High temperatures were forecast for the mid-sixties, and we were thankful for that. Our first stop was the Spike Buck access of the Arkansas Headwaters Recreation Area. It was nice to use my Colorado State Parks pass to avoid the usual parking fee, and I quickly climbed into my waders and rigged up my four weight Sage fly rod. Jane, meanwhile grabbed the Sunday paper and set up shop at a picnic table along the south bank of the river. At 11AM it was in the high 50’s and I felt comfortable in my Columbia long sleeved shirt under my fishing shirt as I walked anxiously down the shoulder of Route 50. When I reached the large bend in the highway roughly 100 yards below the parking lot I cut down the bank to the river. I began my quest for trout with a weighted 20 incher and a bright green caddis pupa. I worked this combination as I moved upstream and experimented with dead drifting and active manipulation but failed to entice any interest. After twenty minutes or so of focused casting, I decided to make a switch and replaced the bright green caddis with a tiny RS2. As I approached noon and moved closer to Spike Buck I finally picked up a small brown and had several momentary hook ups presumably on the RS2; however, the action was quite slow. I decided to pick up the pace and cover more water while dedicating only three casts to any target area unless it looked particularly attractive. Also the 20 incher didn’t appear to be doing anything, so I clipped it off and added a split shot and beadhead hares ear as my top fly while continuing to present the RS2 on the point. This helped quite a bit and in a short amount of time I landed another small brown on the beadhead hares ear. By 12:30PM I’d added a third small brown, and I was close to Jane and the car so I paused for lunch. We debated whether to eat at Spike Buck or move to another location, and since I wasn’t overwhelmed with the quality of the fishing, we decided to move to the next access area up the river at Five Points. We parked along the small cul-de-sac that leads to the protruding river overlook and grabbed a picnic table under a huge cottonwood tree. More clouds began to track overhead and the breeze picked up so I decided to put on my fleece. Jane found a nice spot for her folding chair after lunch on a small beach behind a large boulder that served as a windbreaker. Meanwhile I decided to once again walk down the highway around 75 yards and then descend the steep bank to the river. When I arrived close to the water I saw a nice 25 foot pool behind some protruding boulders and proceeded downstream a bit further to get below this enticing area. Sure enough on the first cast to the head of the pool along the left side a ten inch brown struck the RS2 as I began to lift and recast. I was encouraged by this turn of events and added another larger brown that jumped my swinging fly along the right current seam. For the next two hours I worked my way up along the left bank and prospected with my nymph combination in all the likely pockets and slots. The wind picked up off and on and periodically some clouds blocked the sun. On several occasions I spotted emerging BWO’s, but never saw any rising fish. My fish count moved from five to ten during this stretch and most of the fish grabbed the fly on the lift or swing. As I expected the RS2 produced but I probably landed two more on the hares ear. At three o’clock I arrived at the nice pool below the large rock wall that Jane was using as a wind screen, and peered into the dark deep water. I began tossing my nymphs upstream and allowing them to drift along the long current seam that was 15 feet out from the beach where I stood. On one of these drifts the indicator dipped just as the nymphs were about to swing away from the seam and I set the hook and landed another brown in the 8-11 inch range. On two subsequent drifts higher up near the start of the pool I experienced momentary hook ups. As I was contemplating my next move, Jane appeared on the top of the large boulder, and inquired about my plans. I told her I’d like to fish for another half hour until 3:30 and if the action didn’t pick up I’d be ready to depart. I circled around the huge boulder and dropped back down to the river to a point where there was a twenty yard stretch of pocket water. I covered the pockets next to the bank quickly using my three cast and done strategy and arrived at a sweet spot where there was a nice long slot with some fairly deep smooth water from the midpoint to the tail. As I observed a cloud blocked the sky and the wind picked up a bit and I began to notice some fairly regular rises. Perhaps I could entice some of these fish to strike my RS2 as an emerger by employing my jigging method through the slot. The area I am describing was approximately twenty-five feet long but only eight to 10 feet wide and roughly in the shape of a banana. One fairly regular riser was eight feet below the point of the slot right where the riffles smoothed out. I cast my flies and indicator above that point and as the indicator moved five feet downstream of the rise point, it suddenly darted to the side and away from me. I immediately set the hook and felt the weight of a fish that was heavier than any I’d caught so far on the day. Unfortunately after I stopped the downstream run and turned the fish, I realized that it was foul hooked on one of the small fins along the belly behind the head. I managed to plane the fish across the surface and into my net, and it was indeed a nice rainbow probably 13-14 inches in length. I was disappointed at this turn of events, but didn’t have time to dwell on it as I realized quite a few fish continued to rise in the area. I despaired of using my nymphs for these fish and undertook the task of clipping off the nymphs, removing the spit shot and disengaging the strike indicator. I opened my foam patch in my front pack and carefully removed a size 22 CDC blue wing olive. On the third or fourth drift I spotted a rise in the approximate location of my difficult to see fly and set the hook and enjoyed the throb of a 12 inch brown. After quickly releasing the brown and sopping up the moisture absorbed by my fly on my shirt sleeve, I fluffed up the wing, and flicked another cast to an area where I’d spotted a rise. Once again after several casts and accounting for the downstream gusts of wind, I spotted a rise near the anticipated position of my fly and set the hook into another brown. I was pretty excited with this late afternoon hatch and two bonus fish that sipped my CDC olive, but just as quickly as the action commenced, the sun reappeared and the hatch was over. There were additional clouds in the sky to the west and perhaps they would induce another flurry of hatching BWO’s, but it was now nearly 4PM, and I could tell Jane was getting anxious to make the return trip to Denver. I circled around the deep pool below the large rock and observed the water for a bit, but nothing was showing on the surface so I reeled up the fly and clipped it off and prepared for the return to Denver. It was fun to get out after a two week postponement due to weather, but the fish were on average on the small side. I saw no signs of an imminent caddis hatch, but the fish were somewhat active on the BWO nymphs and I did experience some decent albeit brief surface action. 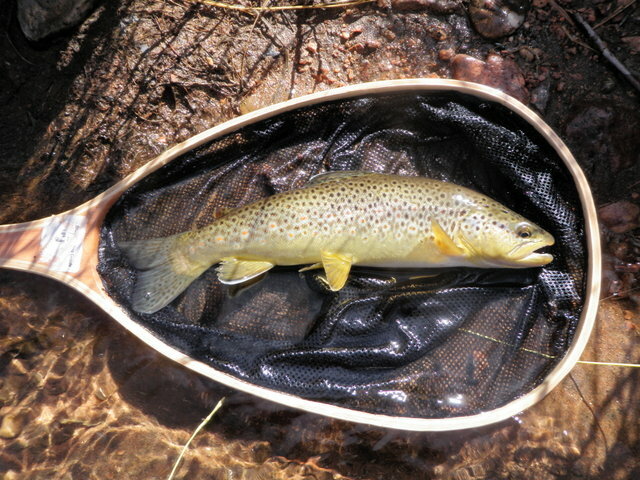 Hopefully the next snowstorm will pass quickly and I can return to Colorado streams for addtional quality fishing. 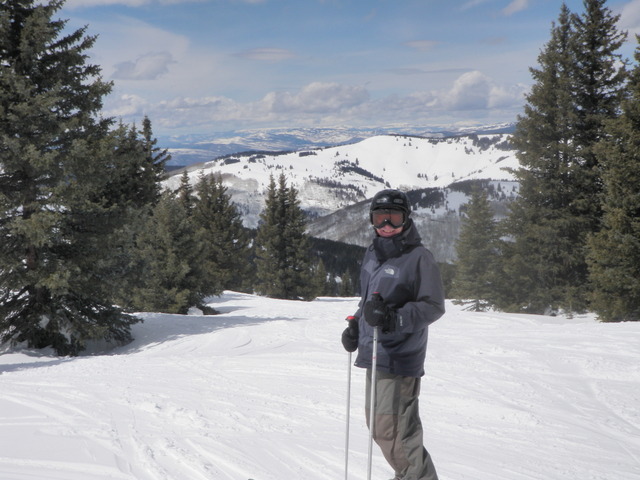 Folks that do not live in Colorado make the assumption that skiing isn’t very good after the end of March. In fact after the warm March that was experienced in 2012, I’ve talked to out of state skiers who are reluctant to book ski vacations during the last two weeks of March. This is great for Colorado skiers because it keeps the tourists off the slopes and offers uncrowded slopes and small lift lines for those of us who continue to ski late in the season. I’ve lived in Colorado for 23 years and more often than not the ski areas close because of a lack of skiers, not because the snow coverage is too thin. In addition unlike many skiers, I love the warm conditions that yield slushy snow that is the consistency of mashed potatoes. Occasionally one encounters these sort of conditions in April, but more often the snow is more similar to the middle of February. It is true that there is a higher likelihood of encountering icy crust early in the morning and this is probably the worst type of snow to ski on. The snow softens and thaws in the afternoon during the previous day and then freezes overnight creating hard rock solid crust where skiers pushed snow aside during their turns. The answer to this downside to April skiing is to sleep in and enjoy a big breakfast. Wait for the sun to move higher in the sky and allow the strong rays to warm and soften the ugly crust. Is this a bad thing; sleeping in and enjoying a leisurely morning? Arrive at the ski lift at 11AM and you will be fortified and rested and eager to ski until the lifts close at 4PM. The late starter will experience the warmest air temperatures and the best snow of the day. This is exactly what Jane and I did on Saturday, April 6. We took our time rising and ate a nice breakfast before departing Denver at 9:30AM. With minimal traffic on the interstate and clear weather we arrived at Vail and were in our skis ready to board the Vistabahn gondola by 11AM. Yes it was warm and slushy at the base, but by the time we got to Blue Sky Basin, some clouds blocked the sun and we had some great runs practically to ourselves with snow that approximated early season conditions. 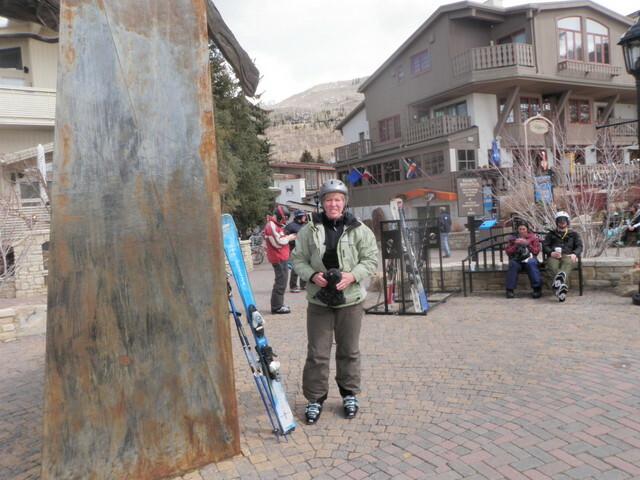 We skied in Blue Sky until 1:30PM and then hustled back to Two Elks for lunch since we thought it closed at 2. When we arrived we discovered the lodge did not close at 2PM, and in fact we received a 15% discount on our lunch because we ate after 2PM and had Epic Local passes. There were numerous empty tables to choose from. After lunch the sky was more cloudy than sunny and we enjoyed some fine runs in the back bowls before navigating our way back down to Vail village. Of course the base was rather soupy by the time we removed our skis at 4PM. We checked the dashboard thermometer as we departed the Vail parking lot and it was 53 degrees. At the top of Vail pass the reading dropped to 38, a 15 degree differential. This explains the nice snow consistency in the Vail back bowls and Blue Sky Basin compared to the soft slush on the lower front side. By the way there was negligible traffic on the drive home with no delay at the small tunnel detour east of Idaho Springs. I’m looking forward to more April skiing before closing the book on the spring season. With Thursday expected to be a nicer day than Wednesday, and being in wait mode at work until the office manager announced that the numbers were ready for February, I decided to undertake another fishing venture. 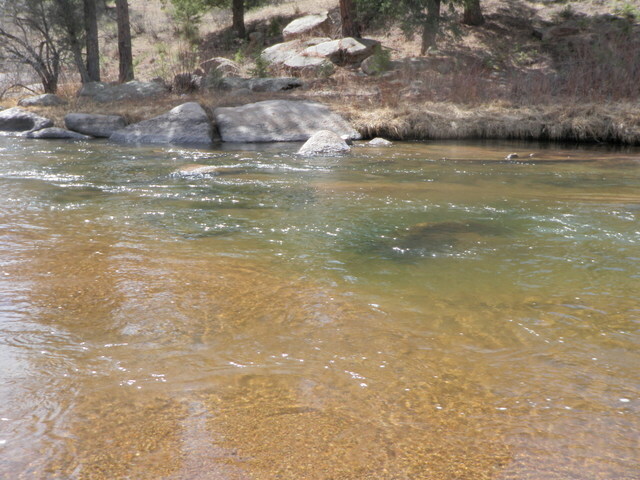 I looked at the flows on the streams closer to Denver and settled on the South Platte River below Deckers. 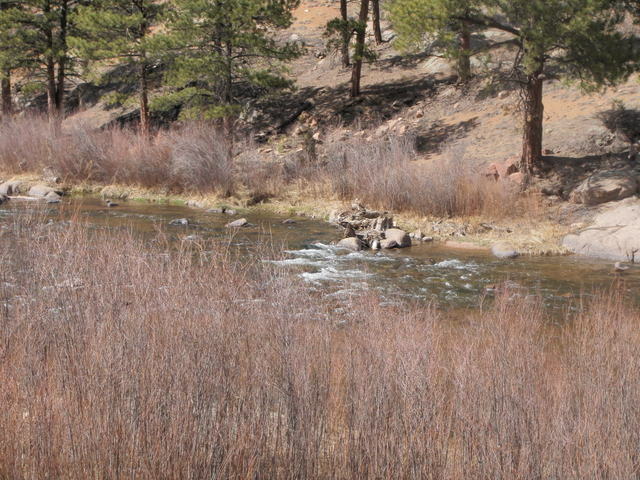 The flows out of Cheesman Reservoir were 97 cfs and they increased to 117 in the village of Trumbull. This is fairly low, but I’ve seen flows around 50, so I figured it wouldn’t be ridiculously low. I can reach the lower stretch of the South Platte in 1.5 hours so this played into my thouight process as well. I took care of several chores and departed the house by 9:30 and traffic in Denver was light so I arrived at my destination and was in the water fishing by 11AM. I chose to park at the lot by Whale Rock a couple miles downstream from Nighthawk. The temperature was in the low 50’s when I began fishing so I wore one layer of fleece, and I was quite comfortable. Another fisherman was upstream in the area where the river divided around a small island and I wanted to fish the pool and eddy at the bend so rather than begin further downstream where the river shoots through some large boulders, I elected to begin at the bend pool. I rigged with a strike indicator on my tapered leader and added a split shot then a beadhead RS2 and a zebra midge. I began at the lower end of the bend pool and began working my way up with casts directed to the seam between the current and the smooth pool on the opposite side. When I reached the midpoint of the seam, my indicator paused and I set the hook and felt the throbbing of a decent fish. 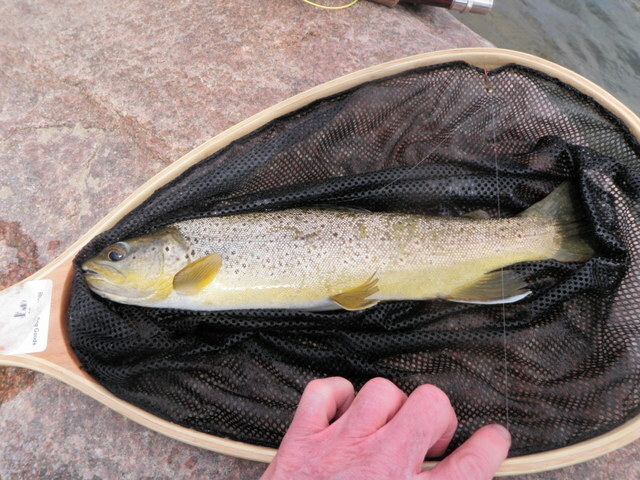 The brown trout fought defiantly which surprised me as I expected a small 9-12 inch brown. When I finally netted and photographed my catch is stretched out to around 13 inches. I was quite pleased with this early outcome. When I cast to the very top of the seam I noticed another pause and hooked and landed another brown in the 11-12 inch range. I was feeling pretty confident as I’d now landed two fish in the first half hour. I wasn’t able to coax anymore trout from the bend pool, so I decided to fish up stream a bit along the high bank where the main current ran. I was working the narrow slot between the current and bank but to no avail. Meanwhile the fisherman above me did in fact appear and began fishing the top of the run that I was headed toward. He must have seen me as he retreated fairly quickly, but I decided to return to the area below the bend to water that was totally undisturbed. I hiked down a narrow path for 50 yards or so and moved into the river where it divided into a small side channel. I began working my way upstream covering a lot of water quickly. The depth was only three to four feet and extremely clear so I made long uptream casts on my side and three quarters casts toward the far side. Nothing was showing interest and in fact I was seeing only one or two small trout bolting for cover as I waded slowly upstream. Finally I got to a nice deep run with a slower moving pocket on the inside. I was sure this would yield some action, but again I was disappointed. I spotted some nervous water next to the opposite bank, so I quartered a cast up and across. Sure enough as the flies began to swing away from the bank, a brown hammered one of the flies. I set the hook and the fish immediately cleared the water but the hook came flying back. I moved up a bit and in similar fashion the indicator stopped in a deeper trough and I set the hook so that a rainbow launched out of the water. Once again the excitement dissolved as the fly came flying back free of any grip on the fish. When I reached the bend I decided to adjourn to the car to eat my lunch as it was close to noon. After lunch I walked up the road to the rocky area near the huge boulders. I fished this area thoroughly and carefully, but again no interest was shown if there were in fact fish present. A deep run above the large boulders and below the next parking lot provided another disppointment. I passed an elderly gentleman stooped over the river as he seined the water with his net and moved to another favorite stretch where the river flows next to the dirt road and over a very rocky streambed. I passed the lower portion as it typically fishes better with dry flies or dry/dropper rigs and moved up to the nice long deep run that feeds the rocky pool stretch. I ran the nymphs through this attractive area quite thoroughly but once again I was surprised to see no evidence of fish. I was now losing confidence in my ability to land anymore fish under the bright blue sky with the relatively shallow flows and extremely clear water. I rounded the next bend and waded to two or three nice deeper areas where I’d enjoyed past success, but nothing was showing. Another fisherman was now above me in some riffles, so I walked back to the rocky area and clipped off my nymph apparatus and tied on a olive body caddis with a RS2 dropper. Surely this would entice some small browns from the rocky pool area. I methodically covered the bottom end and did notice two decent browns bolt under a large boulder next to the bank due to my wading upstream. As I approached the best part of the pool, the elderly fisherman who had been seining the water appeared above me. 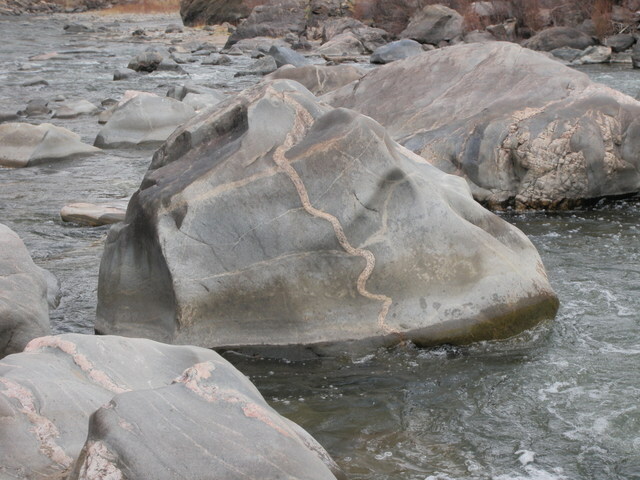 He was at the very top of the pool and began making downstream casts. He kept a distance of around 20 yards, but he clearly was disturbing the top portion of the stretch that I had my eyes on. I fished out a nice pool/run 25 foot stretch where I’d landed fish previously and then climbed the bank and returned to the car. I planned to fish for another hour so I decided to drive back to the area where the road from Sprucewood joined the road along the river. I parked where there used to be a pay phone and made some half hearted casts to some deep water behind protruding boulders, but again this proved fruitless. After the bend there was some nice water with rocky pockets next to the bank and I’d caught nice fish there in previous visits when I lived in Castle Rock. I crossed over and decided to at least try out one of my newly tied pool toys to see how they cast and float. I attached a tan body pool toy to my line and below the bend added a beadhead hares ear. I began working upstream prospecting the likely pockets and seams along the northwest bank. I wasn’t catching fish but I was falling in love with the rythmn of casting and following the highly visible hopper imitation. It floated quite well although occasionally the poly indicator material became saturated so I gave it a quick dip in my dry shake. Next I moved up ten yards and reached an exceptionally juicy area where the river flowed along an angled log that protruded from the bank. Between me there was 15 feet of nice water with moderate depth with numerous submerged rocks on the river bottom. As I looked at the water, I spotted two trout nestled in a depression at the very tail of the pool by the point of the log. I began to drift my hopper and nymph over them and on perhaps the seventh drift, one of the fish actually moved from its position as my flies drifted overhead. Since I wasn’t having much luck moving and prospecting I decided to focus on these fish and I clipped off the hares ear and replaced with a beadhead RS2. Again I thought I saw one of the fish wiggle its tail and move slightly when the nymph drifted by, but there was no take. I cast this combination for perhaps ten drifts and then reeled up and again switched the point fly. This time I tried a beadhead soft hackle emerger, and once again I began flicking casts above the position of the two fish. 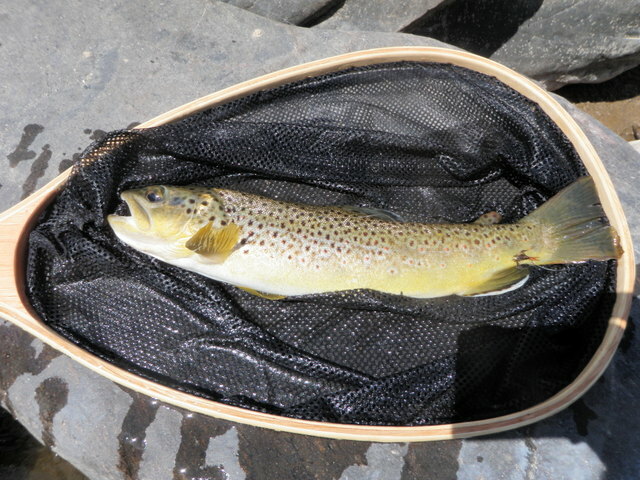 On the third of fourth drift I allowed the pool toy to drift further downstream than normal and as I lifted my rod to pick up the flies and recast, one of the browns angled up and grabbed the soft hackle emerger. After all this work I’d finally landed another 11 inch brown. I released the small brown and worked upstream a bit further to a point where the main current runs along a long slate rock ledge. Dave Gaboury and I used to catch quite a few fish from this area and we called in Dave’s Run. At the very tail I spotted a couple fish dimpling the surface in a fairly regular pattern. I thought about transitioning to a CDC BWO, but thought perhaps I could drift the pool toy and soft hackle emerger and lift the trailing fly to elicit a strike. Mistake. The large indicator fly appartently spooked the feeding trout and the game was over. I belatedly clipped off the dry/dropper set up and tied on a CDC olive and then rested the water for five minutes or so, but the hunt was over and the fish discontinued their feeding. It was now 3PM and I was quite tired and the fishing remained quite challenging so I elected to return to the car and ultimately to Denver. 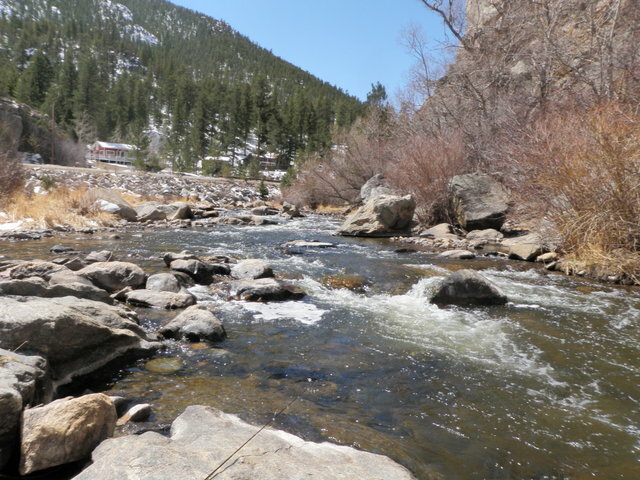 It was a gorgeous spring day to be outside, but very difficult conditions for fishing in the South Platte River. After a brief cold snap moved through Colorado on Monday and Tuesday, nicer weather was forecast for the remainder of the first week of April. Steve Supple and I planned to take advantage and scheduled our first trip to the Arkansas River for Wednesday, April 3, 2013. After experiencing the fishing aberration that is named Grey Reef, would we face a dose of reality and crash back to earth with a loud thud of a day? I arrived at Steve’s house in Lone Tree at the appointed hour of 7AM, and we transferred Steve’s gear from the garage to my Santa Fe and set out on our trip to Canon City and beyond. Traffic stalled a bit in Colorado Springs as we met the morning rush hour and the fog was rather dense from Monument to Florence, but we managed to make the trip in a couple hours. We anxiously watched the dashboard air temperature as it hovered around the freezing mark and desparately prayed for the sun to break through the clouds and warm things up before we began to fish. Unfortunately as we pulled into a pullout along route 50 at the braids section above Pinnacle Rock, the temperature read 37 degrees. I once again wore my down vest under my waders and my ski hat but decided to eshew my toe warmers. Steve elected to fish the channel that splits away from the road just across from where we parked and I began in a moderately deep run right next to the road and across from the car. I started out with the nymphing rig and tied on an Arkansas rubber legs and a beadhead RS2. In the first run I experienced a split second hook up but then things went dead until I moved above the Y where Steve’s channel split off to a nice deep run and pool. In the bottom of this stretch I also failed to create any interest in my flies, so I decided to abandon the RS2 and tie on a reliable beadhead hares ear nymph. 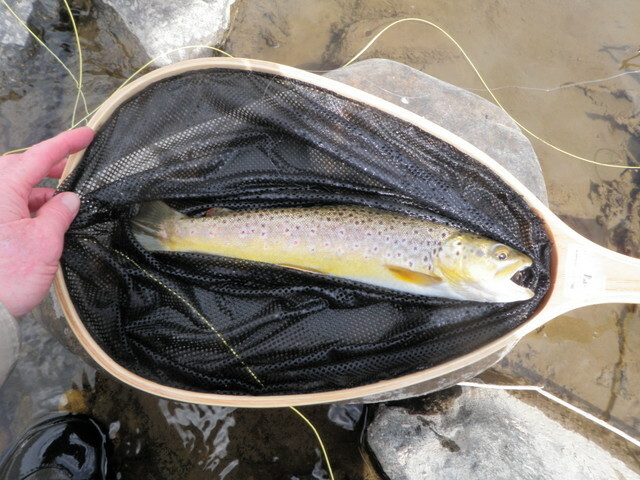 This turned the tide, and toward the top of the run a small brown attacked the hares ear, and I had my first Colorado brown trout of the new season. Shortly after landing the first fish, I snagged the nymph combination on a stick, and broke off both flies. The Arkansas rubber leg didn’t seem to be doing much, so I swapped it out for a 20 incher and plucked a replacement hares ear from my patch. This combination was a winner and I landed six more browns over the remainder of the morning until around 11:45 when I worked my way across to meet Steve and return to the Santa Fe for lunch. One of the seven morning fish was a nice 13 inch brown and I stopped to photograph it as it was my first decent fish in Colorado for 2013. Steve and I compared notes, and he seemed to be having similar success, but he was catching his fish on a baetis nymph imitation. We decided to move to a new location for lunch so we drove back east on route 50 to the Salt Lick access and parked there. We took our lunches down by the river and observed a pair of small browns rising fairly frequently next to a large protruding rock in front of us. This prompted me to switch the hares ear for a Craven soft hackle emerger BWO imitation as I began fishing a nice long run after lunch. I experienced two momentary hook ups as the soft hackle emerger made a swing at the end of the drift, so I crossed to the north bank and worked upstream imparting action to my flies and landed three more small browns on the tiny wet fly. There was an exceptionally brief BWO hatch in the hour or so after lunch, but I hesitate to call it a hatch as I observed minimal surface feeding. Clearly however the fish were active on the emerging nymphs and I began to catch fish by jigging my nymphs on direct downstream drifts back toward me and executed bad downstream mends to induce takes on the acceleration. When I’d landed around 10 fish, it seemed that the action slowed, so I swapped the soft hackle emerger for a beadhead RS2, and this resulted in a couple more fish. I was catching fish but they were spaced apart and required quite a bit of casting and covering a fair amount of stream real estate. Eventually neither of my flies were producing so I decided to try a bright green caddis pupa on the off chance that the fish were beginning to tune into these bugs which become very prevalent in a few weeks. Sure enough I added three more browns to my count on the caddis pupa and they attacked the fly aggressively on the swing. I began to impart movement on every drift and this paid modest dividends. By 2:30 I reached a stretch of fast pocket water and decided to retreat back to Steve’s position and worked my way back across the river to the bank next to the road. Steve was working the pool above the parking lot with tiny BWO dry flies, and he was experiencing a bit of success, but we decided to make another move to the Parkdale recreation access. The river is quite wide at Parkdale, but a few attractive spots presented themselves. Steve gave me a nice deep run below a huge protruding boulder directly across from the picnic tables where we parked. Meanwhile he moved up along the bank to a nice stretch more suitable to his dry flies. I worked the water below the boulder thoroughly with one split second hook up and then went above the boulder to drift my flies next to a huge 5 X 10 foot foam area. On the fifth or sixth drift a fish attacked the caddis pupa as it accelerated from beneath the foam to the run next to it. I set the hook and immediately a 14 or 15 inch brown jumped from the foam. 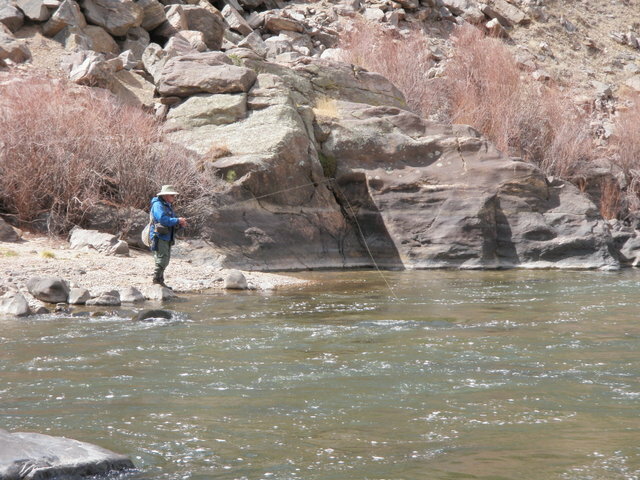 I played the fish on an angle to my right to the top of the faster riffles just above the boulder. I decided to switch and angle the fish sideways to my left to bring it around and hopefully tire it, but the fish somehow broke free during this maneuver. When I reeled up my line I discovered the green caddis pupa was missing and all that was left was a broken knot. Needless to say I was disappointed. I moved up the river across from Steve and decided that this water begged for a dry fly, so I sat down on the bank and removed all the nymph gear and replaced with a brand new tapered leader. I tied on a small CDC BWO imitation and made some nice downstream drifts, but to no avail. Eventually I climbed up on the bank and shuffled down the path to the picnic table area and half heartedly cast in a marginal spot near the car. In a short amount of time Steve joined me and we decided to call it a day. We both landed double digit fish that were on the small side even for the Arkansas River. Normally this would be a satisfying opener for Colorado, but coming off the euphoria of big rainbows and lots of them on the North Platte, it was a bit of disappointment. It will take some time to come back to the reality of local fishing.